In a 2006 national referendum, voters in Panama overwhelmingly approved plans to expand its Canal—an effort that will construct a deeper and wider third set of locks, and double capacity through the century-old gateway. The vote set in motion a publicity machine that has been working in overdrive ever since. Memorandums of understanding between the Panama Canal and U.S. port authorities stoked anticipation and excitement. Then, as construction commenced and images of dry excavations began circulating, the celebratory smoke gave way to a clearer picture of what the expansion project might mean for global trade. Today, less than three years from completion, alarm bells are ringing as port authorities seek to secure last-minute funding, enhance infrastructure, and fine-tune existing operations. Shippers and consignees are similarly evaluating their supply chain networks and investing in new distribution centers (DCs) to capitalize on the economies of larger New Panamax vessels. Even as the pull of New Panamax capacity draws interest and investment to Southeastern ports, West Coast intermodal transportation is still the go-to route for most Asian-origin container volume. In some cases, even importers that have tested all-water routings from Asia to the U.S. East Coast still prefer the U.S. landbridge option. In 2005, high-end patio furniture importer Summer Classics was working with Averitt Express International to manage Asian-origin shipments, some of which were transiting the Panama Canal. The Montevallo, Ala.-based company supplies U.S. dealers and retail outlets including Brookstone, Home Depot, Crate & Barrel, and Neiman Marcus. It also has a retail presence in the Southeast. At the time, Summer Classics was transshipping freight through the West Coast ports of Long Beach, Los Angeles, and Tacoma. Closer to home, it made arrangements with some Florida customers to take direct container shipments from Asia through the Canal. Summer Classics also had freight coming into the Port of Charleston that moved by rail to Atlanta, and was then drayed to Birmingham. 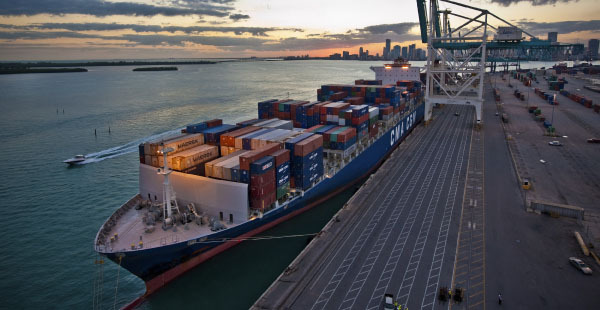 With West Coast port congestion an emerging concern, and because Summer Classics was controlling inbound transportation from Asia through its third-party partner Averitt, it had the flexibility to reroute shipments accordingly. Fast-forward seven years, and Summer Classics' sourcing and distribution footprint has changed considerably. The importer still works with Averitt as its sole logistics provider, but the nature of its transportation and distribution network has evolved. "We are bringing in roughly 800 to 900 containers per year now, compared to 350 in 2005, and opened a 45,000-square-foot distribution center in Los Angeles," says Andy Kennedy, logistics manager, Summer Classics. "We bring all containers through Long Beach to our DC." The company still direct-ships containers to East Coast customers via the Panama Canal—anywhere from 50 to 100 containers per year—but not nearly as many since the 2008 economic downturn. "We had a good thing going for a while, bringing containers into the Port of Mobile. But service times eventually lengthened and our carrier of choice pulled out vessels," Kennedy says. "The current problem with going all-water to the East Coast is the outrageous end-drayage cost to Alabama. If fuel prices continue to drop, we may change the way we bring in some containers. But currently, all freight will go West Coast, then on to Alabama."